The hit true crime series Murder Made Me Famous is now on PodcastOne. Catch a new podcast every Tuesday on PodcastOne.com or Apple Podcasts. 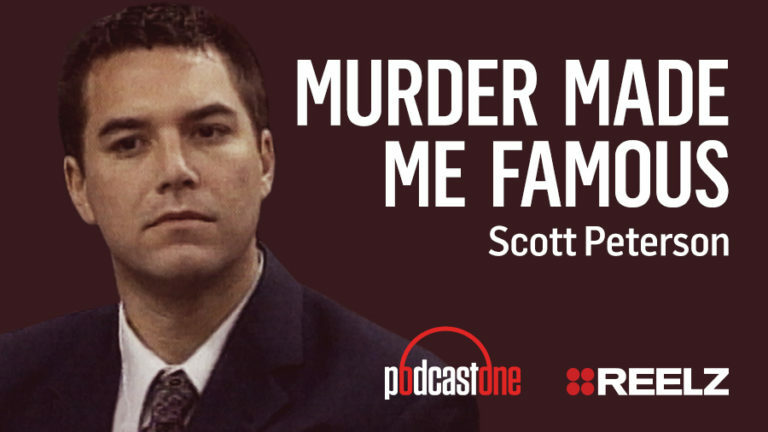 Murder Made Me Famous: Scott Peterson chronicles one of the most significant criminal trials that ever captivated the nation, the disappearance of Laci Peterson. A true crime story with twists and turns to rival any soap opera. On Christmas Eve 2002, Laci Peterson disappeared while she was 8 months pregnant, and her husband Scott Peterson was the prime suspect. The families held out hope that Laci would return, but were devastated by the gruesome discovery of two bodies in April 2003. The bodies of a baby and mother washed ashore in the San Fransisco Bay and were identified as Laci and her baby Conner. Police had already been circling Scott Peterson as their prime suspect after their investigation turned up inconsistencies with his story, and an unsuspecting mistress. After the discoveries of the bodies, Scott Peterson was quickly arrested for murder. Listen to the podcast for all the details of why officers were looking at Scott in the first place, the shocking discovery made in his car during his arrest, and the aftermath of his murder trial.